Adrian Williams, a neuroscience major, wants to be secretary of health and human services someday. Adrian Williams was elected student body vice president for the 2018-2019 school year. He is a sophomore neuroscience major with a minor in psychology and wants to be the United States secretary of health and human services someday. Williams, who has traveled to 15 countries, is in Switzerland representing North America at the World Health Organization at the UN building. In the past, he has traveled on several mission trips abroad to help underprivileged communities. In Switzerland, Williams is working on writing policies, meeting international delegates and testifying before different committees on health issues, particularly the topic of increasing access to essential medicines for people across the world. 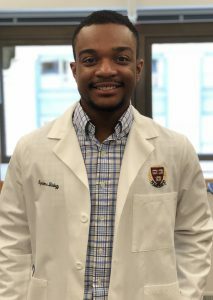 During the summer, Williams will also work on a research project at Harvard Medical School. He will research computational biology and gene sequencing alongside Jeremy Gunawardena, one of the top biologists in the world. Williams was also named Wright State’s 2018-2019 Newman Civic Fellow for his commitment to public service and dedication to addressing educational disparities for minorities in STEM fields. He will represent Wright State at the national Newman Fellowship conference this fall. He decided to run for vice president of the Student Government Association because he wants to make a difference at his school and in his community. 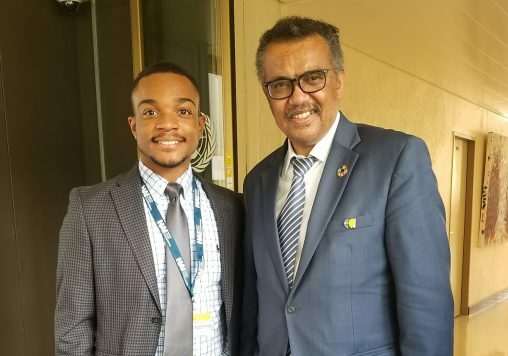 Wright State sophomore Adrian Williams met Tedros Adhanom Ghebreyesus, director-general of the World Health Organization, during a visit to the WHO. Some of Williams’ goals include campus safety, increasing opportunities for student life and continuing previous vice president Holley Mapel’s work in retention and admissions. He also wants to continue working for textbook affordability and inclusive access for students. After graduation, Williams plans to attend medical school to earn a dual M.D./J.D. so he can work in health care policy and politics.